The year started with a bang this time, which makes me look at it with great new hopes. We had great fun together with friends and families and brought in the year with firecrackers and music. Food always tops the priority list of any Bong party and we enjoyed the vast spread that we pampered ourselves with. And then unlike most weekends the beginning of the year saw us lazing in the house and having great time with the baby and some very close friends. But the New Year also brings in the inevitable question of new resolutions. I know many of you do not believe in making resolutions for a year and even some says that we can set goals any time of the year. True, but I always make new resolutions on every first day of a brand new year, with the hope that this year I would be able to stick to my promise…. Its another case that most have them are never realised. But the gone year has taught me many a valuable lessons of life and now I approach and analyze things in a realistic manner. So this year at the time of setting goals for myself I tried to fix achievable goals. Am no Super woman (between do they wear salwar kameez, scrub sink, feed wailing babies and change diaper???) and so no super goals for me this year. I have set some simple goals to make our lives healthy and finally have left the desire of being stick thin. So I have promised to walk for 30 minutes everyday, without any excuse. If it rains outside I will walk in my drawing room (with the inevitable situation of the baby hanging from one of my knee. Trust me he does that).between if you want to do the same check this. On weekends I will do aerobics for at least 30 minutes. Will not skip breakfast and will eat one fruit everyday. Will at least have one serving of soup and five servings of lentils every week. Also will drink atleast one cup of green tea every day. Will limit sweets to only 2 servings every week. Otherwise am happy with the way we eat at the moment. We don’t eat white bread, only eat rice on weekends and do all the housework by ourselves. My work, blog and my garden are my priorities the way they appear in the list. And will give them the time they need. On personal front the birth of my son has changed a lot in me. Now am less lazy, more active, much more patient, very very loving and quite practical. Looking forward to many more years with him to learn and do things together. That’s it for the moment. What are your resolutions for 2011? If you want to share am all ears. 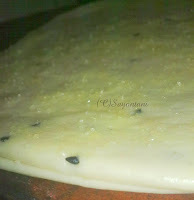 Jibe gaja pronounced, as jee-be-gaw-ja is a traditional Bengali fried dough food or dessert. This is the Bengali cousin of North Indian Shakkar para. The name literally means tongue shaped gaja or fried pastry. Flour is kneaded with lots of shortening (traditionally with ghee or clarified butter) and then rolled, slathered with more ghee to create layers. Deep fried and then dipped in thick sugar syrup to create these sinfully delicious fried goodies. 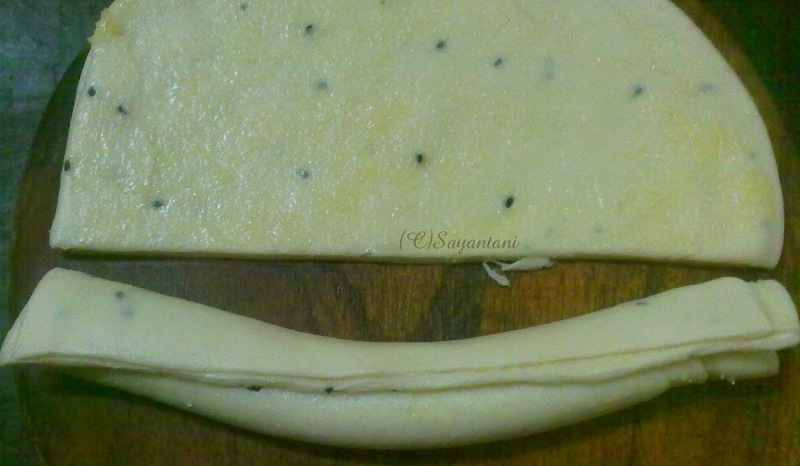 This is very Famous in Orissa also, as this comes as a part of the offerings to The Jagannath Temple. We generally make this during the Bijoya Dashami time (the last day of the Durga puja or the Day of dashera) to feed the guests who come to exchange Bijoya greetings. This year we were not in a mood to share happiness during that time and I made this to send to a special person as a part of Arusuvai Friendship chain. In a big bowl mix the flour, salt and nigella seeds. Pour the oil in it and rub with your finger till a breadcrumb like texture is achieved. Add water very little at a time till you get smooth dough. Knead the dough on an oiled surface till it becomes soft. Mix the ghee with the rice powder and make a smooth paste. Keep aside. Take a medium size ball from the dough and roll to 1/6 to 1/7” thickness. Make another one of almost the same size. Spread little of the ghee mixture on the top surface of one roti and cover it with another one. Again smear the top of the second roti with little ghee mixture. cut the sandwiched rotis in half. working with one half, roll it tightly to a log. Cut 1” pieces from this log and roll out each piece to a long thin rectangle. Repeat with the rest of the dough. Keep these covered in all stages. Once you are ready to fry the gaja put the oil in a heavy bottom pan. There should be enough oil for deep frying (min 2” oil). Switch on the heat and keep on low. The temperature of the oil is very crucial and more heat will make the gaja raw from inside. Please see note below. Fry the gaja till golden brown, drain and keep on absorbent paper. Once you are done with the frying let the gaja cool down. In the meantime make the syrup by boiling the sugar and water together. After 3-4 minutes check the syrup by taking a drop between your fingers. Press and release, if you see one thread is forming between your fingers you are ready to go. Mix in the crushed cardamom. Add all the gaja and very quickly stir to coat them evenly with the syrup. The syrup will solidify once the gaja comes in touch with it. If you desire you can dust them with powdered sugar…I did as am in love with the dreamy snowfall. Store in an airtight container and enjoy!!! The heat of the oil is very crucial and I can’t press this point enough. This is what I do. I always heat the oil to smoking point and then switch off the heat and again switch on after 3-4 minutes. That way the raw smell of the oil is gone and the oil is hot enough to cook the gaja till light brown. Also keep on adjusting the heat by increasing or decreasing the flame. Deep Fried Snacks at Tickling Palates. 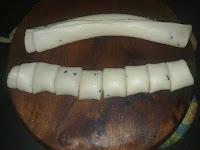 Gaja, gija, deep fried sweet, deep fried dessert, deep fried snack, fried dough snack, fried goodies, Bengali fried sweet, Bengali style fried pastry, bengali fried dough food, Puri gaja, how to make jibe gaja, step by step shakkar para, layered fried pastry, layered goja, how to layer fried dough food, how to prepare layered shankarpali, shakkar para, sakkar para, sakkarpara, cardamom flavoured gaja, tongue shaped sweet snack, bengali sweet snack, best fried snack ever, easy way to make fried pastry, pictorial for jibe gaja, how to make jibegaja, flour based Bengali dessert, sugar syrup, one string sugar syrup, ek tar ki chasni, how to make chasni for fried pastry, ak tarer ras, frying jibhegoja, jibhe gaja. Nice name and this looks so crunchy and nice snack... thanks for sharing this. Delicious fried pastry. Love it. I don't keep any resolutions as it is difficult to follow with a little one in the house. Woww i want to grab some, soo tempting..
delicious n the pics r mouth watering.. 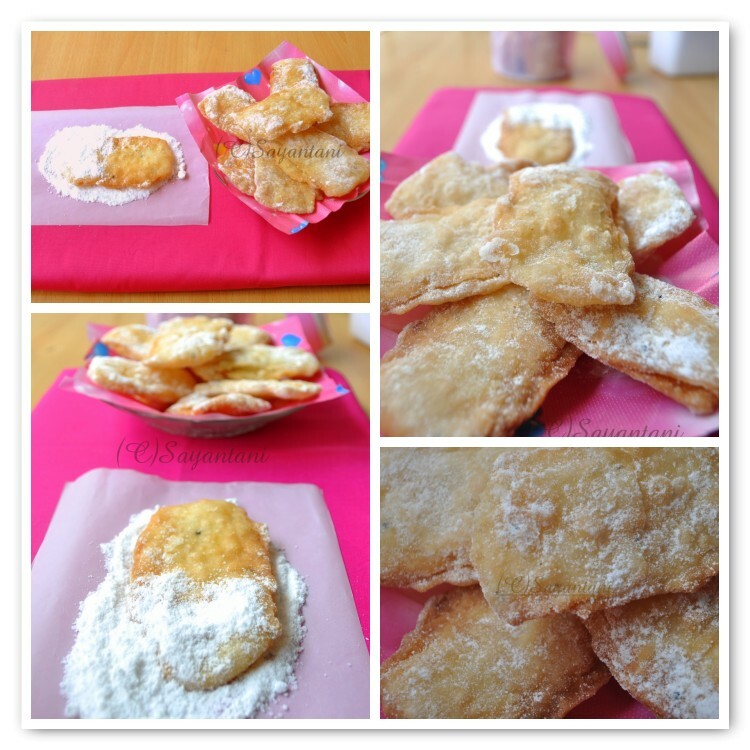 These fried pastry looks so crunchy and yumm. delish! Have a great 2011. First of all Wishing you and family a bright and prosperous Happy new year dear. Coming to the sweet Jibe Gaja....its truly a temptation:) Like reading your new year's resolution. Seems perfect and keep rocking dear! My diet plans are not great, so One of my resolution (apart from exercise), is to make spicy snacks, whenever we need some snacks. Because i always end up doing sweets only...hi..hi! 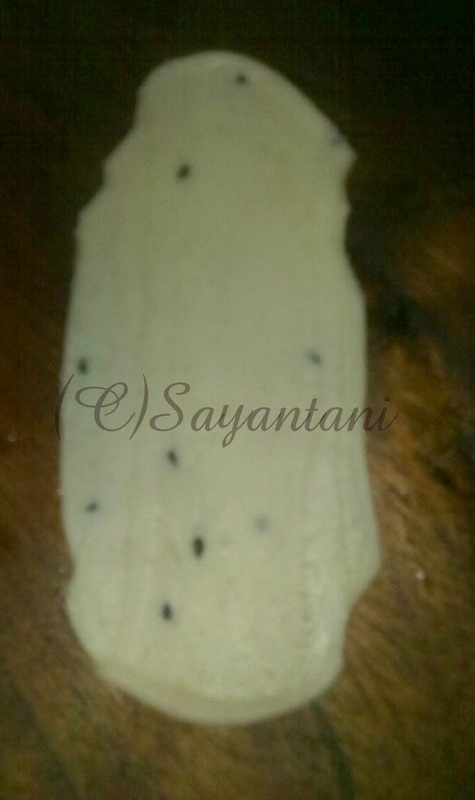 we call this chiroti...and this is the one of my fav sweets since childhood....sinfully decadent darling...u r making me drool...they hv come outso so perfect..10/10.. I'm a compulsive goal setter--I do it throughout the year, one list starts the month, other lists start my weeks....I do have long term goals which I'm always (trying to) work towards---my health is a top priority this year. Last year was terrible for my health and I have to be more proactive (not just for this year, but this minute onwards...) Some steps I've taken , others I'm starting to...........wish me luck, Sayantani. One goal is also to spend less time in front of the computer! LOL--we'll see how that works out. Hope you have a wonderful year ahead, may it wipe out all the bitter memories of 2010 and let there be plenty of sweet memories created in this year. God bless. Hey Sayantani..Mazaa aa gaya post pad kar...Enjoyed reading this post..U have expressed what so many of us feel..but you have expressed it so well..Good luck with ur resolutions..I for one don't make any resolutions..but just try to do the best I can each day..and gd pt. we got to remember from time to time that we r not superwomen and try to make our lives much simpler and stressfree. Love this bengali cousin of Shakker pare..My mom always made these for Diwali. I have'nt had that in a long time..Pack some for me..and hey cd learn some Bengali from you..love this sweet language..
u now have tempted me to make it...so will surely make it soon! :)) yum yum! Probably seeing first time this sweet fried are always tasty! Crispy and delicious! Great resolution and wishing you a Healthy and Joyous New Year for you and family! I love them and your nigella seeds must be adding a nice dimension of spice and aroma to the sweet. I like this snack...we have a similar snack called madakku...(in Kerala)..
Nice step wise pictorial recipe, looks interesting. @Swathi, I totally agree with you, i tried this last year and the baby was very small...could not do anything. @Harini, Rachana and Mandira, Wish you and your family a great new year too! @Viki, same here. I always end up chewing cookies or sweet meats. thats why only 2 servings per week. and this week that limit is already over. @Sanyukta, thanks buddy would love to see your gorgeous presentation with chirotti. @GB, this blogworld is almost like our support group. we get stregth, courage and inspiration from each other. Wish you a very healthy 2011. and spending less time infront of the comp is a big agenda too. @Dolly, thats a great thing tthat you could motivate yourself so well. I would rather love to spend my whole day in a couch if given an opportunity. I need goals to achieve something. @Smitha, great going gal. have a very healthy 2011. @Aipi, please dont tempt me more with your delicious goodies. @Sushma, thanks buddy. love ya. @Anjali, we always add nigella seeds to any fried goody. love the aroma that way. Kalo jeere dewa hoye jaantam na. yumm! have eaten this before, but never made them ! thanks for sharing !! A very new kind of recipe. Looks a perfect snack for the kids after school. Love the crisp and flaky texture of the pastry. Great write up, and am sure you will stick to your resolution. Jibe gaja are absolute tempts!! As a part of my resolution...Itry and learn one new thing every year, baking was my last new thing, this year it's photography. Hopefully will stand up to my own expectations. And yes, maybe if you make my mails "not a spam" they will not land in those folders. The sweet looks great Sayantani. Happy New Year! I love your New Year resolutions, all of which I would like to make as my own too. I am thinking in my head that the only 2 servings of sweet per week might be the hardest to keep. wonderful writup and post...tell me about "baby hanging onto ur knee"... your new year resolutions seems doable...keep it up..
Jibe gaja ta dekhe khub khete icche korche. Jibe gaja, aha ki bhalo laglo dekhe. aae thandate kichu korte icche korchr na. jodio ba onek post korar ache, gorom jama aar shawl dheke boshe cha aar bhajabhuji khacchi. aamai o aaee goja khoob banai, onek deen thake. Jibe gaja looks extremely delicious, Sayantani..Thanks for sharing.. This jibe gaja look delicious: I have not yet tried any of them, but apart from the cardamom they look very similar to some fried pastry made around her for the carnival season! Such nice pictures. Never heard of the dessert but I am sure I can gulp all of them in one shot..
Lovely looking pics..Can gulp all of them in one shot..Was not sure if my earlier comment went through..
@Priya, Sanjeeta, yes these are perfect for kids evening snacks also for tiffin box. @Preeti, thanks and your pictures are always good but was awesome this time. @Indo, yes indo thats my main concern too. @Reva, Krishna thanks for visiting me. @Goridi, amader barite akdom thakena go. amar bor ar chhle mile kachkachie sab kheye fele. @Vanessa, thanks for the clarification. We make something similar like this, but is known as Chiroti with sooji instead of rice flour. It looks so crisp and yummy! Perfect jibhe goja. Reminds me of my childhood. Khub shundor, Sayantani. Ek dibba amake debe? Sounds so yummy! would love to try this . ohh how did i miss this one? This one made without nigellas seeds is called khajli in UP(smaller version of khaja, i am sure you know khaja)and a jaggery coated version is my personal favorite. i was literally introduced to bong cooking by her. I have never seen that fried mung daal pithe anywhere on the internet. have you posted?